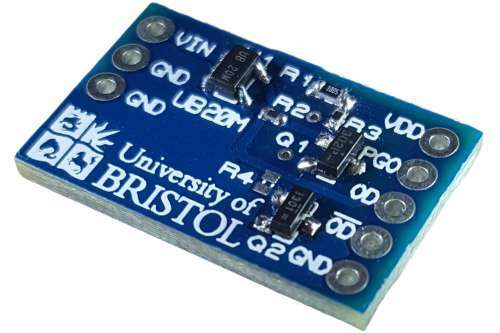 Dr Stark, Reader in Electrical & Electronic Engineering in the Department of Electrical & Electronic Engineering, said: "The ultra-low power UB20M voltage detector provides sensing that is continuous and free. This is because it is able to respond to minute quantities of power from unpowered sensors. No battery or other power is needed for the device to stay alive and listening, and battery maintenance is therefore reduced or not needed. We are now actively seeking commercial partners to use the voltage detector chip in their product, and would welcome companies to get in touch." An electronic sensing device uses power to both listen and react. In sensors such as a security alarms, activity monitors, and other Internet of Things devices, the energy to keep the device alive and listening, can far outweigh the energy used to react. In these cases, it is especially important to eliminate listening power in order to increase battery life and make a system that is less environmentally wasteful. In response to this challenge, the research team, with Government support, have developed a method of eliminating the power drain used to listen, by using minute, insignificant quantities of energy, from the event that the device is waiting for, such as movement of an asset tracker, or infrared light from a TV controller. This energy switches on mains- or battery-powered devices, exactly when needed. The voltage detector chip is also small enough to fit into many autonomous electronic devices. The voltage detector chip uses over a thousand times less energy than existing detectors to create a turn-on signal, merely five picojoules of energy and only around half a volt. Many sensors can provide this without requiring a power supply, therefore making listening effectively free. It can also be used to generate sensing data only when useful data is available, which saves processing power.